The Direct line systems are installed directly on to the cold water line of your existing kitchen faucet. The Direct line UV under the counter Systems is installed under the counter and is easy to maintain. The Direct line UV under the counter systems will remove sediment, mud, dirt, rust, chlorine, heavy metals and inhibits the growth of bacteria. The Direct line filter system can be wall mounted or placed standing inside of the cupboard. Please note that the Direct Line UV does require electricity to operate. Keep in mind tha the Direct Line UV will not change the mineral content of the source water, and so the "base taste" of the water will remain the same. If you have a source water that has a "brackish" or strong mineral taste, then we would recommend either the under the counter Reverse Osmosis or Nano FIltration systems. The Direct Line UV system is only really designed for a single point in an office, buidling or household. If you are looking for a UV system for all the household's water we would recommend the Complete Home UV Systems Loose Components or Complete Home UV system on a stand. The direct line UV Pre-filters have a life span of 24 months. Keep in mind that the 24 month life span is based on municipality quality water, depending on the quality of your water source the life span of the filters may be a great deal less. The UV light's Bulb needs to be replaced every 12 months, irrespective of the source water's quality. Please note that the Direct Line Filter systems are built as needed, as a result it is typically 1 to 2 days before the units will be ready for collection or delivery. 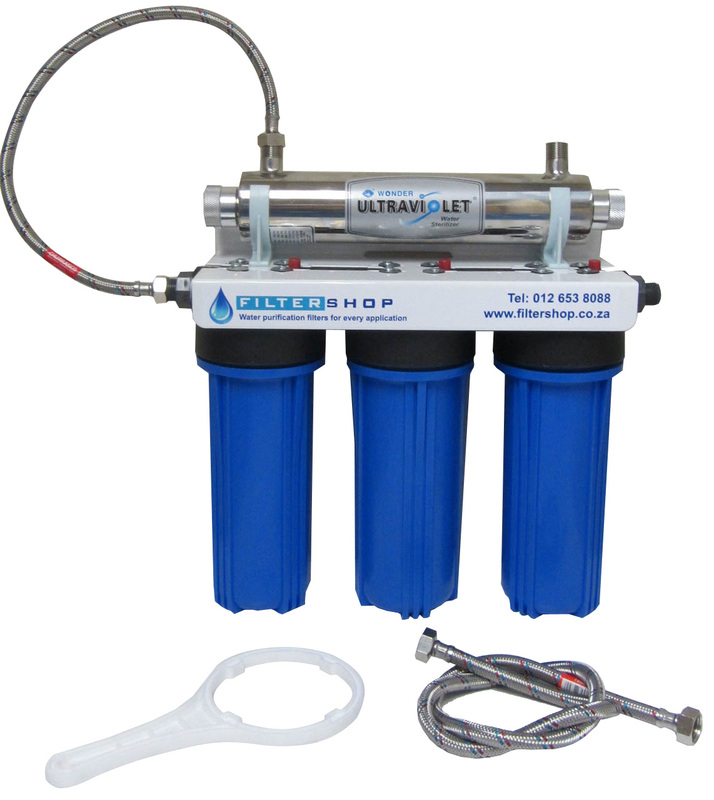 The Direct Line Filter systems are avaliable in either the standard blue housings or in clear housings. Please note that the nature of the clear plastic means that it is more likely to crack if mishandled compared to the blue plastic units. The Clear plastic housings are also more likely crack in the event of high pressure spikes in the source water. We have an agreement with a 3rd party plumbing company for fixed priced installations for standard installations. This allows us to offer installation as an option via our online store. This should cover most situations but as it is a 3rd party company that will be performing the actual installation of your system if additional work or parts are required the installer will have to be paid for this directly. Please ensure that you have read through the description in detail and that you have selected the correct product options for your situation as the plumbers would only be able to advise you on installation and not on the filters themselves. Note however that 90% of our clients normally do a DIY Installations and the kits are designed with that in mind.